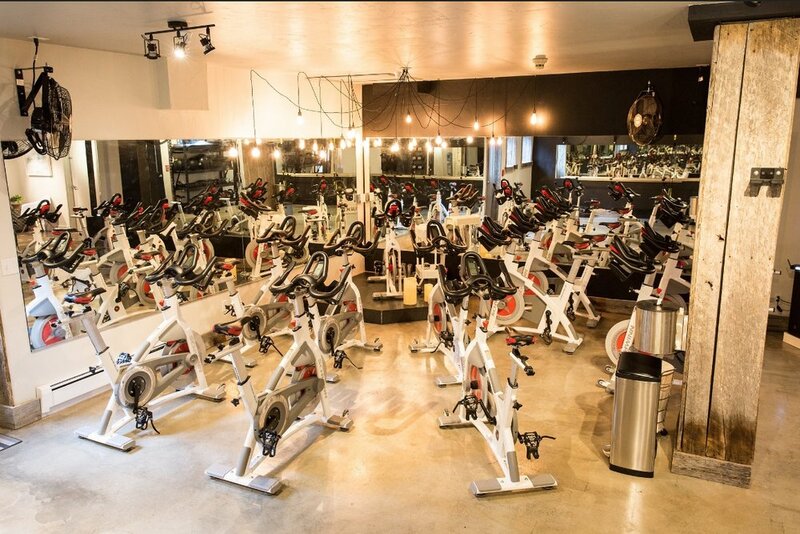 The Pedal Den Telluride's only boutique fitness studio dedicated to indoor cycling and barre classes. We also offer small group and personal training with highly qualified personal trainers and movement specialists. We believe what doesn't challenge you, doesn't change you and that there is a cyclist and athlete in all of us. With hard work you can pedal to your "happy place". Pedal Den started off in December of 2016 as a small indoor cycling studio in an alley way and has since expanded to include barre and strength training. We welcome all ages and abilities as we believe being healthy, happy, and fit is everyone's birthright. Our Schwinn certified instructors teach classes rooted in the principles, approach, and science of real outdoor cycling. Our classes are simple, non-intimidating, and user friendly. The Pedal Den instructors offer fun and motivating rides to an array of music and drills, as well a motivating quotes and a healthy dose of competition to bring out everyone's inner cyclist. Some classes may include tap backs, jumps, and isolations although the majority of every ride simulates what you would do on a real bike. Our classes are results driven. Our barre instructors currently come from varying backgrounds including physique 57 and barre method. All classes will include variations for those who are working with injuries and/or therapeutic needs. Our Schwinn Pro Performance w/ Carbon Blue bikes offer a smooth ride that feel close to the real thing. They are equipped with ECHELON 2 consoles to give each rider instant feedback of RPM/CADENCE, WATTS/POWER, HR, CALORIES and MILEAGE. This offers the rider an opportunity to work within his/her range and watch and note when fitness improves. Hydration is compromised at altitude and hydrating properly is very important. Please drink plenty of water before, during, and after your ride. Please be early to claim and set up your bike. If you are a first time rider, arrive 15 minutes early to get a proper bike fit with the instructor. Due to safety and the courtesy of the other riders, the door will be closed and we ask you do not enter or knock after a 5 minute grace period. Please turn off and put away your cell phone. To respect everyone's experience, please limit unnecessary talking during class. Studio temperature is b/w 65-68 degrees as recommended by the American College of Sports Medicine. Please respect fellow riders and the teacher and please DO NOT open or crack the door. Visit our faqs for more studio information.